Carlos Ghosn thinks Nissan must sell 1 million Leafs a year to make the electric car affordable without government help. One catch: Production capacity will be only 200,000 by 2012. One million. Call it Carlos Ghosn's magic number. That's how many electric vehicles the Nissan CEO says he needs to sell annually to generate a sticker price that is competitive without government subsidies. 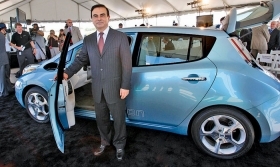 Ghosn offered the calculus during a speech at a Tokyo business conference last week, just two months before the Nissan Leaf electric vehicle goes on sale in the United States and Japan. Volume is key to bringing down the cost of electric cars. Lithium ion batteries can jack the price of a compact car into the lower-tier luxury range. Indeed, Nissan and other electric-vehicle hopefuls are counting on government subsidies to make them affordable. For example, the U.S. version of the Versa-sized, five-seat Leaf is priced at $32,780. But a $7,500 federal tax credit will mean a net price of $25,280, without shipping charges. Hit 1 million in sales, Ghosn reasons, and he wouldn't need the government's largess. Yet even by Nissan's optimistic view, 1 million Leafs is a tall order. The automaker has allocated only 20,000 Leafs to U.S. dealers next year. And with production ramped up on three continents in 2012, Nissan still envisions production capacity of only 200,000. After that, it could be a long, slow climb to the 1 million milestone.